Nexon brings its mega successful series to iPhone. Prepare the water rockets. When building a list of the world's most popular video game, Nexon's KartRider may seem like a strange addition, but this free to play PC racing game has well over 200 million registered users. In fact, one in four people in South Korea have played it. Armed with these impressive statistics, Nexon plans to bring a mobile version to iOS called KartRider Rush, and like its counterpart, you don't need to spend a dime. 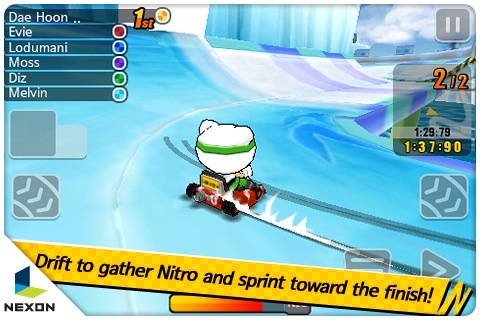 The game plays similar to Nintendo's Mario Kart series, as you speed around tracks hoping to cross the finish line at all costs, even if it means using weapons to jump into first place. These include such useful items as banana peels, nitro, a shield to protect against attack, a water bomb, a spaceship that slows down the player in first place and our favorite item, the flip, which turns the other players' screens upside down; watching them lose their bearings and crash into walls is a riot. That said, weapons only appear in the Item mode. If you don't want to use them, there's also a Speed mode that's all about racing. In addition, KartRider Rush comes with two control schemes. There's the standard tilt to steer option, as well as touch screen steering; we prefer to tilt the iPhone, but the touch option works just as well. These modes also factor in to multiplayer, where you'll be able to compete against three other players using Wi-Fi or Bluetooth. Now as we previously mentioned, KartRider Rush will be free to download, with plenty of content. 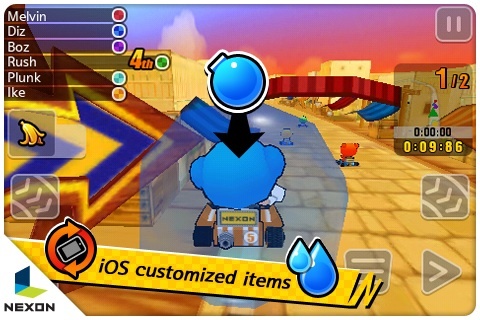 To expand the experience, Nexon will sell downloadable bundles of content that'll include characters, tracks and karts. The company has yet to settle on the cost of these packages, but expect them to be $0.99 or $1.99. KartRider Rush will make its iPhone debut this March, with an iPad release the following month; the game comes to Android this summer.